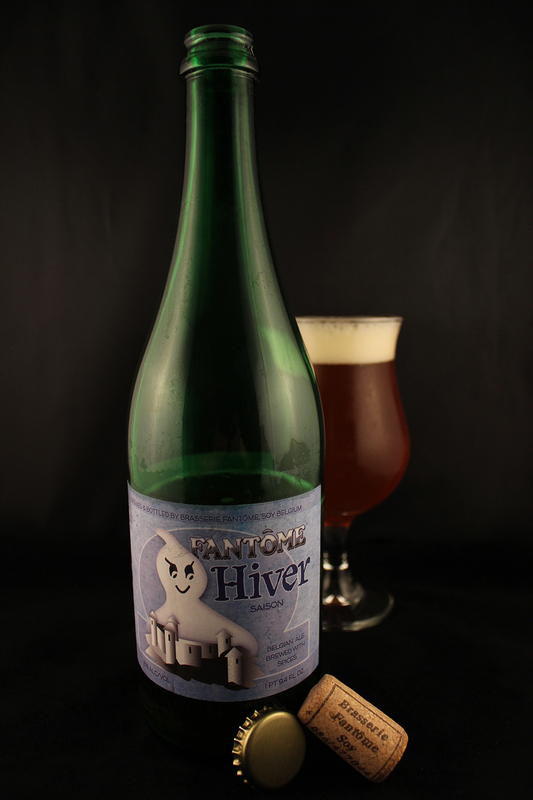 Throughout the years, I have seen beer labels by Fantôme, which has wicked looking ghost. This makes sense, since fantôme is French for ghost. The character reminds me of not so friendly version of Casper the Friendly Ghost. When i was able to finally get my hands on one if their beers, I was more than thrilled. Not only do the labels pop out to me, but I have also read great things about their beers. My first encounter was Saison D’Erezée – Hiver (Winter), and I must say I was pretty damn impressed. First thing to point out here in the visual aspect of this beer, is that this beer is presented in a large 750ml green bottle. There was a cork and bottle cap combo holding this one together. The cork was in the neck with the bottle cap resting right on top. A cork screw was needed to get this one open. The label was a nice lilac or light purple color, maybe even blue to some. The artwork featured our Not-So-Friendly-Ghost with his menacing look hovering over a cheaply computer generated white castle. Nice colorization and placement of the brewery and beer name along side the drawing. The appearance was a murky, hazy peach color with a 1/2 inch of an off-white creamy head. There was no real head retention here, as it quickly disappeared, leaving no lacing at all down the glass. The nose on Saison D’Erezée – Hiver was big on the farmhouse funk, a little sourness, hay, and wheat mixed with some apricot, mango, and some banana notes. Herbal spices and candy sugar are also present. The lingering aroma was farmhouse funk, apricot and herbal spices. The taste is all the same characters as the aroma. Nice mixture of flavors going on here with the Saison farmhouse funk being the major player. There is a little sourness balled up together with some hay, wheat, apricot, mango, banana, sweet candy sugar, and a handful of herbal spices. Very nice mixture and balance in this beer. The aftertaste is a blend of herbal spices, farmhouse funk, and some of the apricot character. This beer has a medium body with a slick and smooth fouthfeel, low carbonation, and a mouth coating slick finish. Overall, I was very pleased with this beer, giving it a 4.5 out of 5 rating. It was damn near perfect. This brewery is not available in Texas yet, so I do have to get these by other means, and I hope to get my hands on other beers from Brasserie Fantôme. I am a huge fan of Saisons, so this is why I chose to get this one first. Metal Connection: This Metal Connection is a bit different than most my choices. I did a search for the word “Hiver” (translated to Winter) for this choice. I found a few options, but most were definitely not to my liking. 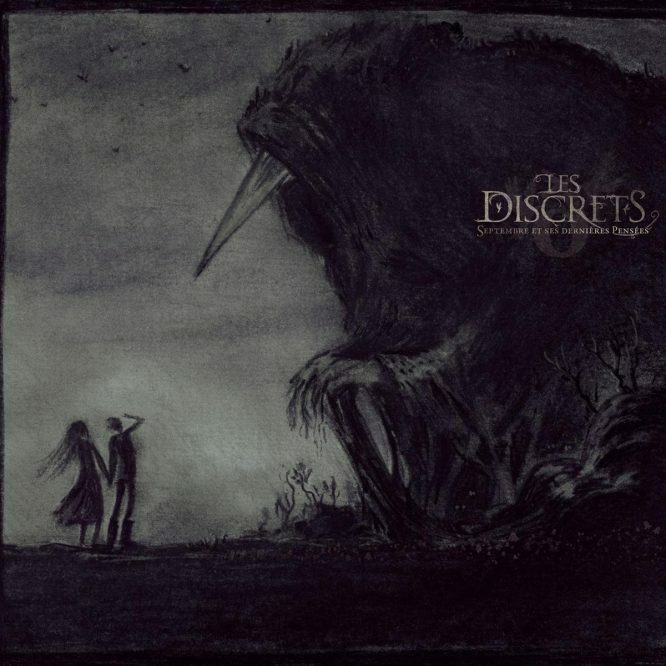 The song, “Une matinée d’hiver” or One Winter Morning in English from the 2010 full length album, Septembre et Ses Dernières Pensées by the French band, Les Discrets. These guys are classified as a Post-Rock/Post-Metal/Shoegaze band, and normally I don’t listen to much of this style. I heard other songs by this band, and they are not that bad. I personallt really like this song here for this Metal Connection. It is very slow, depressing, folk-like, and just has an overall good tune to it. While it’s not very Metal, it works here in this case with this amazing beer. This song could be played while kicking back and drinking on a Fantôme Saison D’Erezée – Hiver. the lyrics are all in French, so I can not understand what he is saying, but I do like the delivery of the vocals towards the end of the song. Take a listen for yourself. Like it, or call me crazy.